Does the thought of taking an exam make your heart race and palms sweat? Though it’s normal to feel a little nervous before a test, feelings of intense worry or self-doubt can hinder your test-taking abilities, as well as cause discomfort. People of all ages can suffer from test taking anxiety— even adult professionals taking a certification test. Fortunately, there are many techniques that can help manage and even overcome your test anxiety. However, while these strategies may for work some, they may not work for everyone. Talk our cyber schools’ counselors or a mental health provider for further assistance with overcoming your anxiety. Come prepared. Being ill-prepared for a test can contribute to your anxiety. Make sure you are preparing for your exam using a study approach that works for you. To do this, think about how you retain information best. Some students are visual learners, while others may benefit most from reading and writing the material. You’ll feel more at ease if you’ve thoroughly studied and practiced the material that will be on the test. Learn to relax. There are a variety of relaxation techniques that can help you remain relaxed and confident come exam time. Focus on calming yourself through deep breathing exercises, relaxing your muscles, and refocusing on a positive outcome. Think positive. Approach the test with confidence and personalize your success using a strategy that works for you. You may prefer repeating some words of encouragement to yourself, or closing your eyes and visualizing a positive outcome. Focus on clearing your mind of negative thoughts, and view the test as an opportunity to show off your knowledge and hard work. Talk to your teachers. You don’t have to feel alone when you have test anxiety. Your teachers are here to help and support you. Talk to your teachers and let them know what’s going on. Your teacher can help you feel more comfortable and offer suggestions, as well as help you understand what will be on the test and how to prepare. 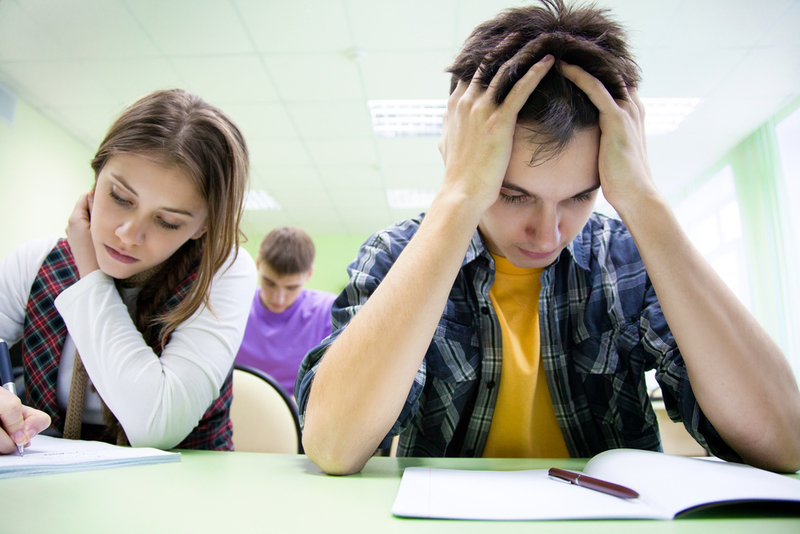 Remember, if you suffer from test anxiety, you are not alone. Reach out to your family, counselors, teachers and classmates for support.